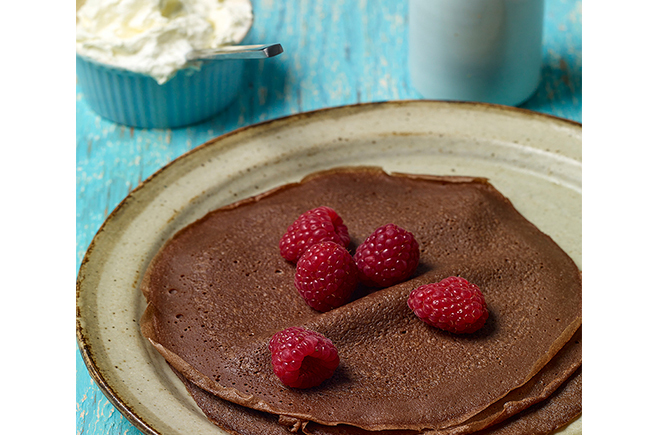 Whether you’re looking for a decadent breakfast or a light, chocolatey dessert our gluten-free Chocolate Crepes are just the thing for starting or finishing your day! We’ve used almond milk in this recipe to keep the crepes dairy-free. However, you can substitute with regular cow’s milk or your favourite dairy-free alternative. Sift flour, salt and cocoa into a large bowl. Add sugar and stir. In a small bowl, combine eggs and milk. Add to flour mixture and whisk until smooth and free of lumps. Heat a crepe pan over medium heat, spray with oil spray. Pour ¼-⅓ cup of batter into pan, swirl to coat. Cook crepe for 2-3 minutes. Flip and cook for a further 1-2 minutes, remove and keep warm. Continue with remaining batter. Serve immediately with your favourite toppings. We like fresh raspberries and whipped coconut cream. For more delicious gluten-free chocolate recipes, pick up a copy of Issue 13 of Australian Gluten-Free Life magazine. Chocolate Crepe recipe by Sandra Basic and photo by Brandee Meier.